It takes ample amounts of black top, singletrack, sunshine and friendly people to create a bikers’ paradise to match Colorado. 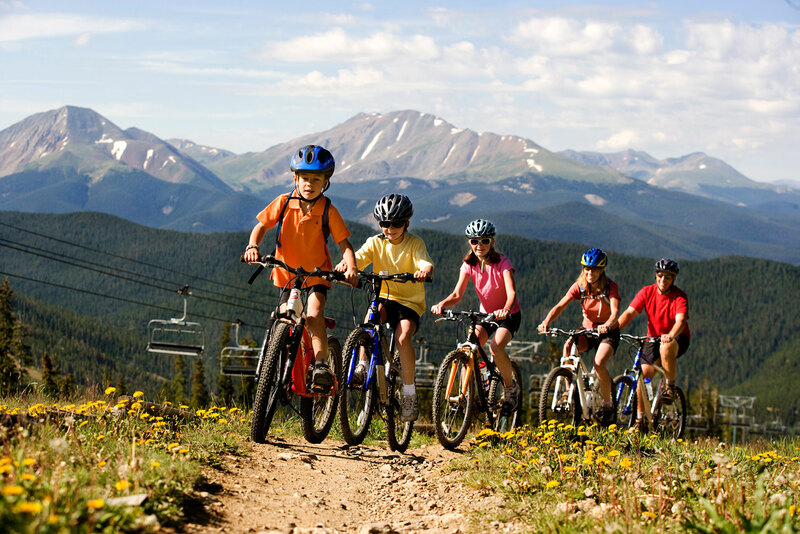 Lively Colorado biking communities ensure that events abound spring through autumn and that road-biking and trail-riding options proliferate in every part of the state. Wherever you go, there you are ... but where to next? That’s where a good map comes in handy, especially on a bike ride with a group. In Durango, for example, rides are rated from easy to difficult. Eagle’s website has detailed navigation of nearly every inch of their trails. And in Steamboat Springs, the maps can help you decide if you need fat tires or skinny. In Fruita and Crested Butte, two of Colorado’s mountain-biking master towns, the trail networks are so vast and varied that a map is a downright necessity. Hundreds of events are to be had each year for cyclers and mountain bikers. Longtime favorites like Ride the Rockies (June), the Colorado Eagle River Ride (July) and the Tour de Fat in Fort Collins (August) are now joined by newer events like the Tour of Vail, Pedal the Plains and the West Elk Bicycle Classic (all three in September). Is red a really, really popular color for bikes in Denver and Boulder? The cities’ B-Cycle program has taken off in recent years and received national attention, placing dozens of bike stations and hundreds of (mostly red) bikes on the roads in summertime. Visitors and locals alike can “check out” a bike at a station, pay with a credit card (or buy a pass) and cruise from station to station. Connection rides between cities are not only beautiful and vary in difficulty, but they’re also well-traveled by bikes and lightly traveled by traffic (read: plenty of shoulder room). There are many to choose from, but for starters try Wolcott to Steamboat Springs, Las Animas to Lamar (with a stop at John Martin Reservoir State Park), Aspen to Glenwood Springs, or Fort Collins to Mishawaka Amphitheatre (ok, The Mish isn’t a town, but when there’s a concert on, it’s close). The ultra-popular Boulder-to-Golden route was recently improved with the addition of a larger, paved shoulder route for bikes. Try the Grand Junction to Palisade “fruit loop” route, which starts at the botanical gardens, then winds riders through the tidy rows of peach trees and grapevines the area is famous for. Colorado has more gold- or platinum-rated bicycle communities than any other state, according to the League of American Bicyclists. Boulder and Fort Collins are ranked platinum, while Breckenridge, Durango, Crested Butte and Steamboat Springs are gold. Silver status goes to Aspen, Colorado Springs, Denver, Gunnison and Longmont, while Arvada, Carbondale, Castle Rock, Golden, Greeley, Lakewood, Summit County and Vail make the podium with bronze. The planet looks pleasing when it passes at a pedal-powered pace. That’s why there’s no better way to see Colorado’s purple mountains majesty or its amber waves of grain than by collecting the 25 long-distance Bike the Byways rides. Start at the South Platte River Trail and work your way toward the Lariat Loop near Denver before tackling mountain rides like Top of the Rockies and finishing off with the bluffs and buttes of Dinosaur Diamond north of Grand Junction. Or, start the other way round at the mystifying Trail of the Ancients and add rides to your list as you work your way north. Either way, Bike the Byways provides unmatched verification of Colorado’s big-time biking credentials.